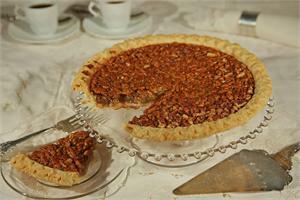 Delta Gourmet Pecan Pie - packaged in a special gift tin - also try our French Chocolate Chip Pecan Pie - YUM! Have you had your Delta pecans today! We grow our pecans in the Mississippi Delta and offer quality pecans and gourmet pecan products for all occasions. Need a gift for someone special - just let us know and we will take the hassle out of shopping. We take pride in producing quality gourmet pecans and guarantee you and your gift recipient will always receive fresh products. Our packaging is unique reflecting the many aspects of the Delta - see our Delta Blues, Delta Cotton or Delta Catfish and Memphis Rocks tins. Need a gift for the Hunter in your life see our Hunters Trio packaging. We ship all over the world so share with your friends no matter where they are.